Samsung Galaxy S II lands in the UK on April 27 | What Hi-Fi? 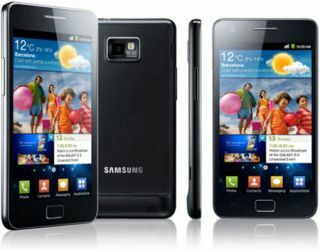 The Samsung Galaxy S II smartphone is coming to Phones 4u on April 27 with a free 8GB microSD for pre-orders. That means you'll have to sign up for a £35/month contract on Orange to get the phone for free. The replacement for the Galaxy S – best multimedia phone in our 2010 Awards – has a 4.3in touchscreen in place of the original's 4in display, and uses what Samsung calls Super AMOLED Plus technology to reduce power consumption while maintaining brightness and clarity. Samsung hopes the Galaxy S II will become the new standard for smartphones when it appears, and will build on the 10m+ Galaxy S phones sold since that model was launched eight months ago.